Geometrica's careful packaging methods for its structural components, cladding and accessories ensure the cargo's safe arrival, regardless of its destination. 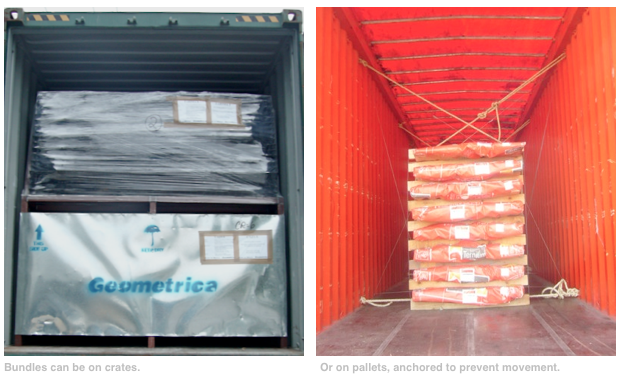 Geometrica materials are doubly packed. Structural parts and accessories are loaded into sturdy metal crates, then the crates are loaded into Dry Cargo (DC) or High Cube (HC) containers. Purlins and cladding panels are tightly bundled with plastic and metal strapping onto metal or plastic pallets, then loaded into Open Top (OT) containers. 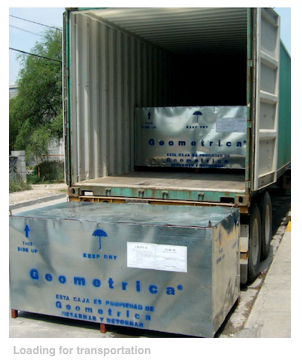 Although the DC, HC or OT containers may be supplied by Geometrica or by others, the metal crates and bundles are always supplied by Geometrica. These metal crates are Geometrica's property. 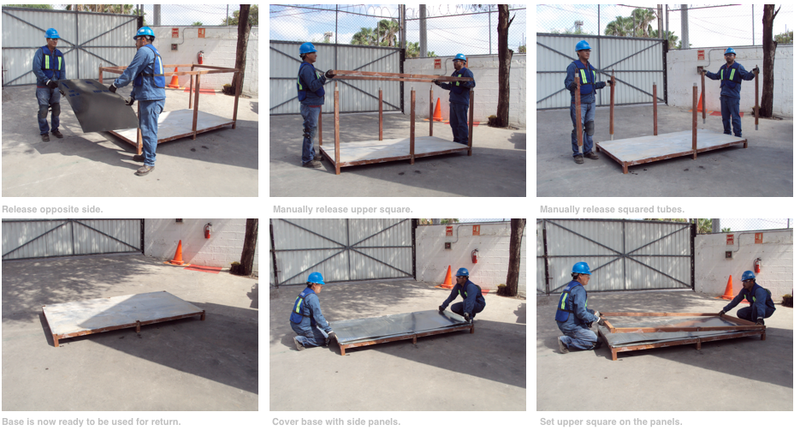 The metal crates are demountable, reusable, very strong and made from recyclable materials. 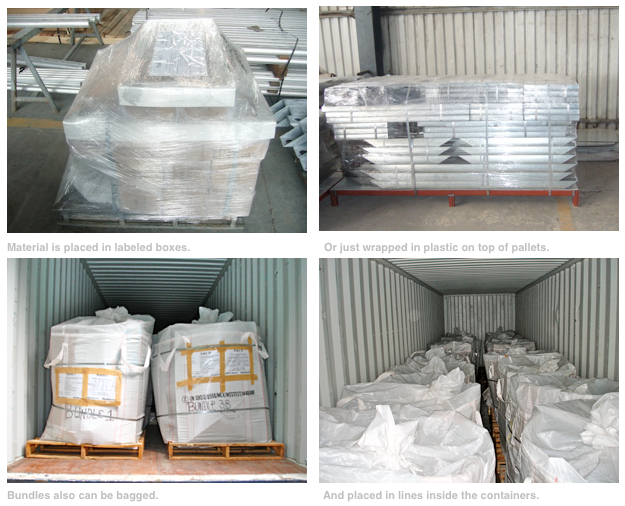 The plastic and metal bundles likewise are made of highly recyclable materials, and designed to withstand the rigors of containerized ocean transport and handling on site. The dimensions and weight of each fully-loaded crate or bundle are carefully controlled to make unloading easy and convenient. Crates are loaded into the DC containers with readily available hydraulic dollies capable of handling 3 tons. A crane or forklift removes the crate from the container and places it on the ground. Cranes also can unload OT (cladding) containers. Generally, after unloading and disassembly, we ask our clients to return our crates for reuse. Returning the crates minimizes scrap on site, as well as packaging costs. Geometrica will decide between returning the crates or selling them to a third party. 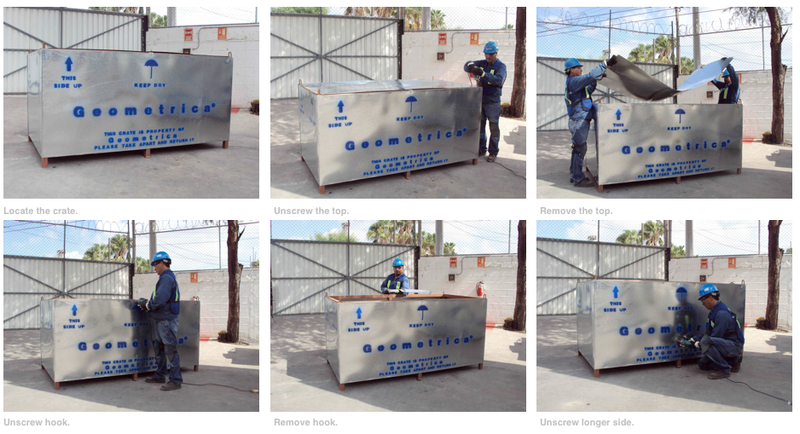 We ask our clients to disassemble the crates and load them into one or two containers placed on site by Geometrica for return to our factory. The labor required for this operation is minimal and is included in the time estimates we prepare at the beginning of each project. 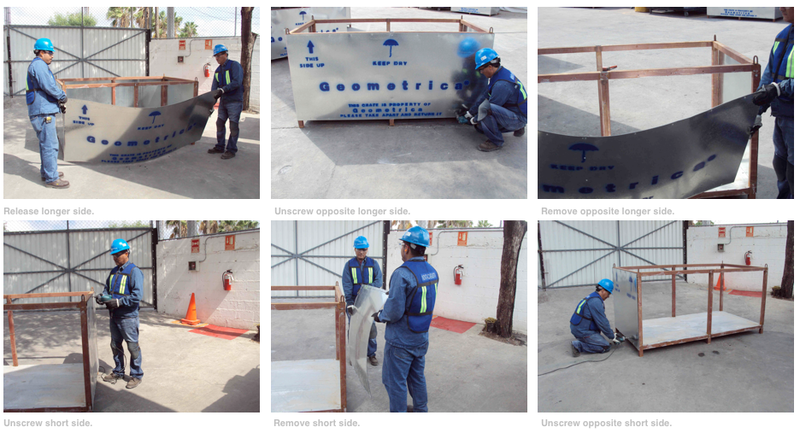 This document describes the types of packaging that we provide for Geometrica products, how they are handled on site and how they are labeled. Our tubes, hubs and miscellaneous accessories are packed in separate crates and loaded into containers. 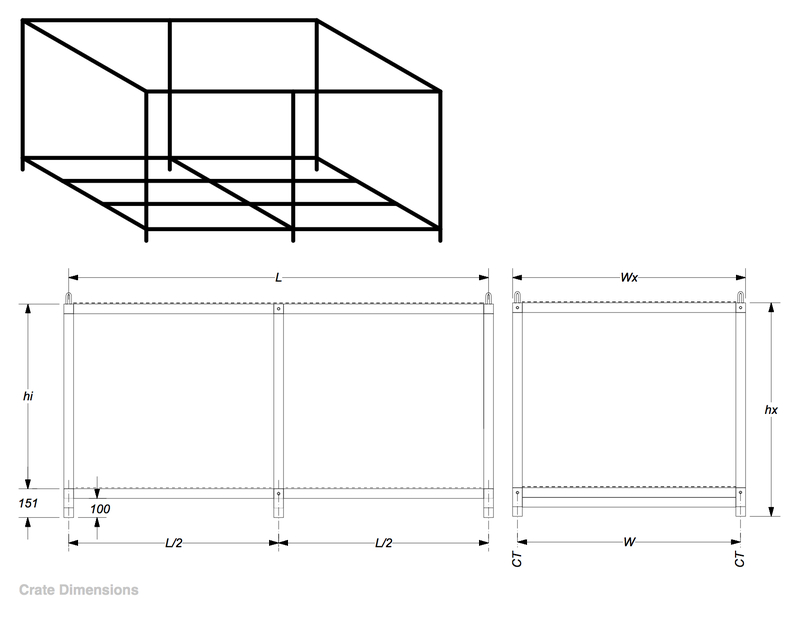 This system enables us to keep the neighboring parts for a structural section packed together, simplifying installation. Opening the crates, with their thousands of pieces, would be like opening a puzzle box, but here all the pieces of the puzzle are pre-sorted. Geometrica's metal crates not only provide shelter from water and harsh weather, they also are strong enough to withstand handling on roads, trains or ships. Their walls include space for packing lists or any other document requested by our clients. The surfaces are designed for easy labeling, and the labels are protected from water by plastic wrap. Our efficiency does not sacrifice the safety of our cargo. We have designed our crates so all materials can be packed with minimum dimensions and weight, reducing freight charges while protecting each part inside. 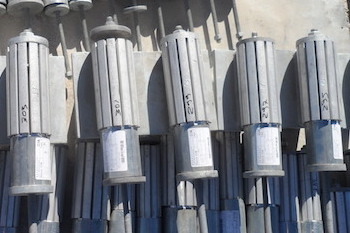 Crate weights and dimensions are standard, unless atypically long tubes are required for the building. 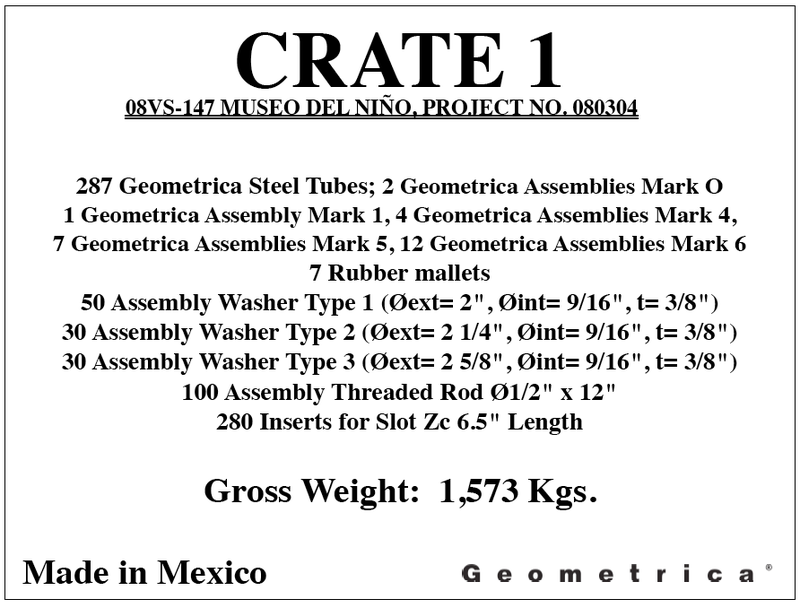 We will share drawings of our crates with our clients if their marking or packing manuals require it. Our crates are easily stacked for efficient use of space, while protecting the parts inside from environmental damage for months at a time. They can be moved easily by forklift. The image below shows how stacking saves space and minimizes the risk of mishandling. 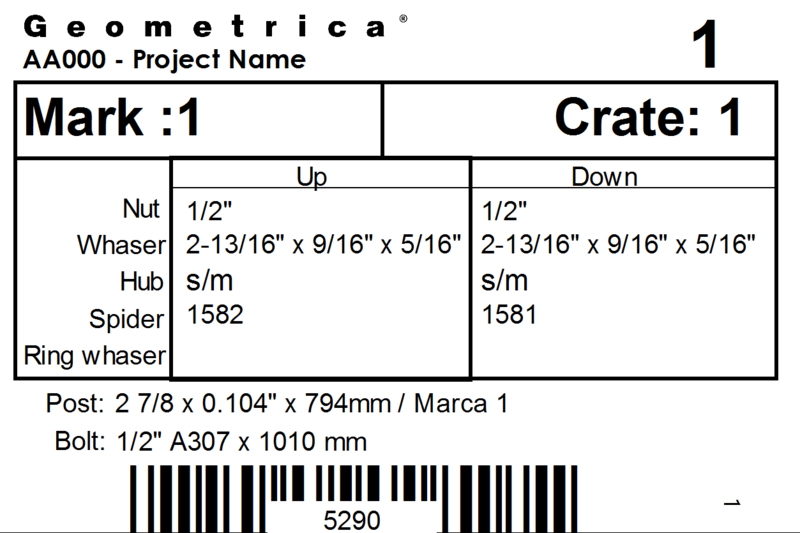 Geometrica crates come in various sizes. 2.25 meters is the most common length, so that crates may fit with their length aligned across most shipping containers. "Long" crates, occasionally 4m or longer can be loaded into OT containers. Width and height vary independently from about 1m to about 1.6m. Crates are configured to weigh around 120 kg when empty, and up to 3000 kg when full. Consisting of square steel tubes and steel sheets, they are bound together by fasteners, permitting tubes of varying sizes to be inserted horizontally. Geometrica crates will completely fill a DC container or a semitrailer truck efficiently, minimizing ground-transportation costs. The bottoms of the crates are framed as a single welded unit for better protection during transport or storage. 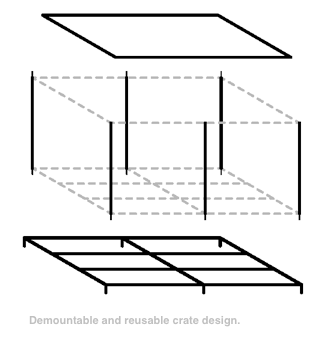 Most crates are demountable and reusable. They can be taken apart easily and returned to Geometrica, which reduces our clients' packaging costs. 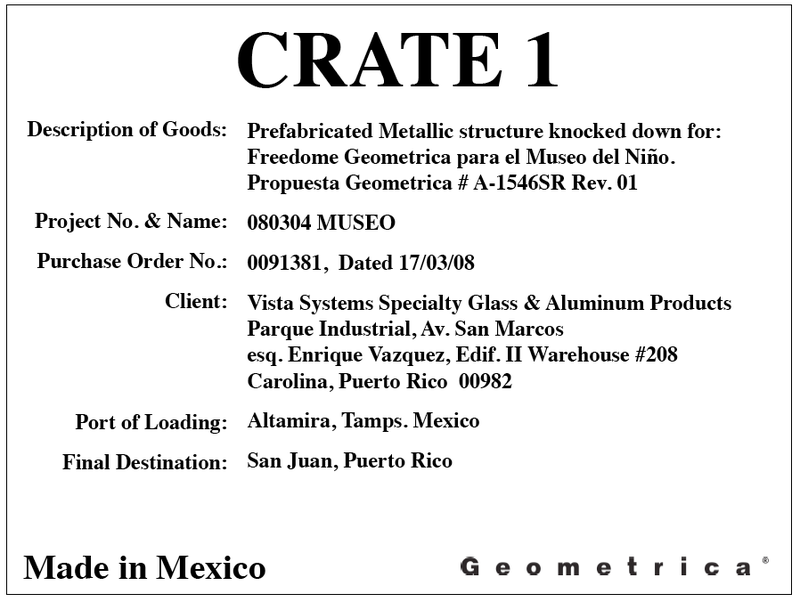 Geometrica retains the option to request its clients to demount the crates and ship them back to Geometrica's factory in Mexico. 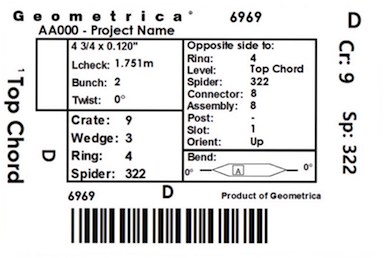 If Geometrica exercises this option, the cost of demounting and loading the crates into the shipping containers is borne by the client, although the shipping costs are paid by Geometrica. A few of our crates are nondemountable and nonreturnable. If Geometrica does not exercise the option to recover any or all of the crates, the client may dispose of them at his convenience and cost. 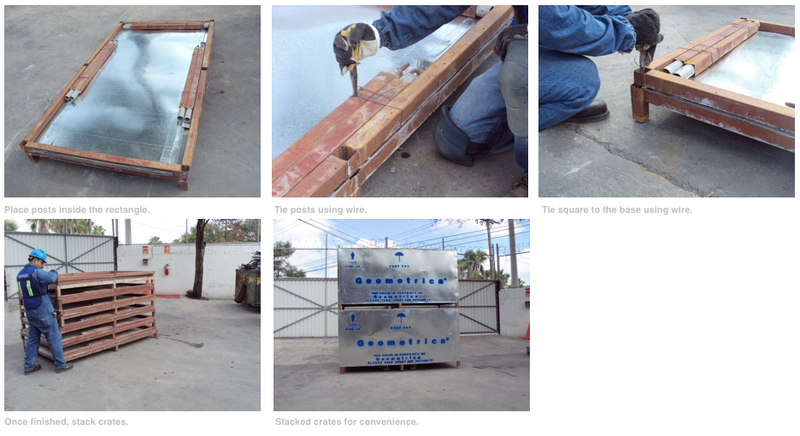 Oversized materials, such as cladding or flashing, are shipped in protected bundles that are usually placed on top of the crates to make the best use of available space. The parts are placed on metal pallets and covered to protect them from moisture and environmental damage. Each pallet is labeled so it can be placed properly at the site warehouse for future use. The label names the pieces enclosed so the site administrator knows exactly where they belong in the structure. A second label, for our clients, contains the information needed for customs and/or installation control. Our labels provide the basic information for shipping, storing, customs and installation. They are protected by plastic wrap and are placed so they are always visible, either on the sides of the crates or on top of the bundles. 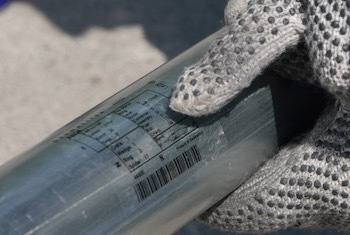 Tubes, hub assemblies and purlins are dot-peen marked and then labeled with stickers to identify the part, dimensions, and location and orientation on the structure. Whether it's a crate or a bundle, Geometrica packages its structural components efficiently and carefully. Each crate and pallet is marked and labeled for ease of tracking and to ensure proper installation of the structure. Though crates and bundles are sturdy, we do not recommend their transportation as loose cargo. We recommend crates are loaded onto Dry Cargo (DC) containers, and purlins and cladding panel bundles onto Open Top (OT) containers. Our crates can be transported within the construction site on regular trucks, singly or stacked two deep. As the photos illustrate, our packaging is strong enough to protect the materials inside, but also light enough to be moved with regular machinery. These duality of protection and portability is a trademark of our packaging and appreciated by our customers. When operating a stockpile, for example, the operation does not have to stop while building the cover, and the compact and portable crates can be set aside. Geometrica structures are classified as 'prefabricated buildings' under harmonised system code 94060001.